Thank you for your interest in registering for the Race for PAWS virtual 5K and 10K sponsored by Waggle, a lifestyle app for active dog parents! With Waggle you can find cool places in your city that you can bring your dog to, receive discounts on pet products and more! 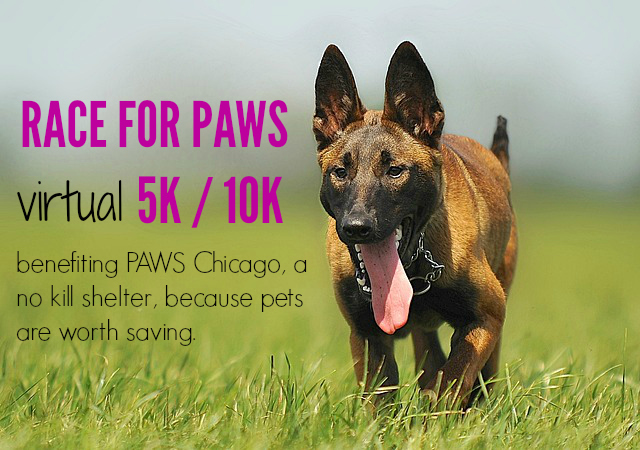 One hundred percent of the race registration fee for this event will benefit PAWS Chicago, a no-kill animal shelter saving the lives of homeless dogs and cats. The funds will be used to used to rehabilitate sick and injured animals and then find them loving homes through PAWS Chicago, the largest no-kill shelter in the Midwest. Step2: Fill out the form below to complete your registration no later than March 10, 2015. Step 3: Complete your 5K or 10K race by March 20th and email me proof of your results (Garmin pic would work). 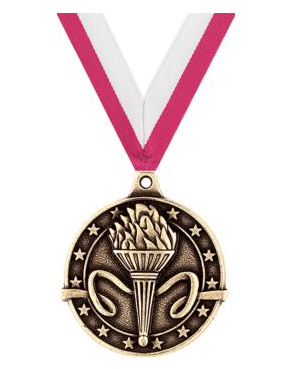 All finishers can receive a finisher’s medal. The top 3 finishers at each distance will receive a special medal. Thank you so much for supporting PAWS Chicago and me. I really appreciate you! Here is what the finisher’s medal looks like – because we can’t all make the Olympics but we can all be champions for pets! If you are entering the race and would like to have your pet featured on the blog please email me runkristina@gmail.com with a picture and a fun story — the story of the day you rescued your pet would be a great one! So cool! I’ll be signing up for this – I got my kitty cat from PAWS so it’s a cause near & dear to my heart! Hi Lauren! Thanks for dropping in and for the email! I’m looking forward to hearing more about your PAWS foster and adoption story! I chickened out and registered for the 5K, but I am hoping I will be in 10K shape by March…we’ll see. I have lots of rescue kitties, I need to try to get it together and send you at least one lol I’ve haven’t been able to keep up lately with life. YES!!! Please send me pics and a story or two so I can feature them!! Whoo! I’m excited that you’re jumping in! So many speedy ladies are in now!!! I’d love for you to send me those pics! This is so cool!!! I’m definitley signing up for this!